A single currency within the Eurozone area. A common monetary policy. Interest Rates are set by the ECB for the whole Eurozone area. Growth and Stability Pact. 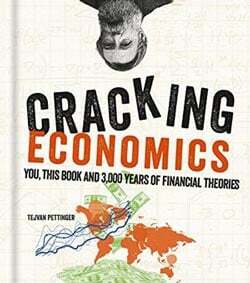 In theory there are limits on government borrowing, national debt and fiscal policy. However, in practice member countries have often violated the strict limits on government borrowing. Interest rates not suitable for whole Eurozone. A common monetary policy involves a common interest rate for the whole eurozone area. However, the interest rate set by the ECB may be inappropriate for regions which are growing much faster or much slower than the Eurozone average. For example, in 2011, the ECB increased interest rates because of fears of inflation in Germany. However, in 2011, southern Eurozone members were heading for recession due to austerity packages. The higher interest rates set by the ECB were unsuitable for countries such as Portugal, Greece and Italy. Limits Fiscal Policy. With a common monetary policy it is important to have similar levels of national debt, otherwise countries may struggle to attract enough buyers of national debt. This is a growing problem for many Mediterranean countries like Italy, Greece and Spain who have large national debts and rising bond yields. Lack of Incentives. It is argued that being a member of the Euro protects a country from a currency crisis. Therefore, there is less incentive for countries to implement structural reform and fiscal responsibility. For example, in good years Greece was able to benefit from very low bond yields on its debt because people felt Greek debt would be secured by rest of Europe. But, this wasn't the case, and Greece were lulled into a fall sense of security. No scope for Devaluation. Since the start of the Euro, several countries have experienced rising labour costs. This has made their exports uncompetitive. Usually, their currency would devalue to restore competitiveness. However, in the Euro, you can't devalue and you are stuck with uncompetitive exports. This has led to record current account deficits, a fall in exports and low growth. This has particularly been a problem for countries like Portugal, Italy and Greece. This shows the effects of Eurozone members becoming uncompetitive. 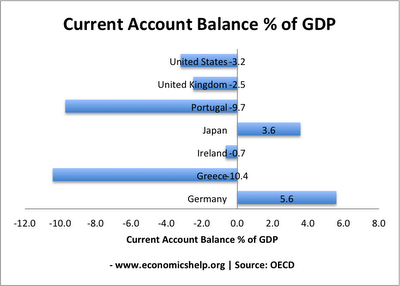 Very high current account deficits. No Lender of Last Resort. The ECB is unwilling to buy government bonds if there is a temporary liquidity shortage. This makes markets more nervous about holding debt from eurozone economies and precipitates fiscal crisis. 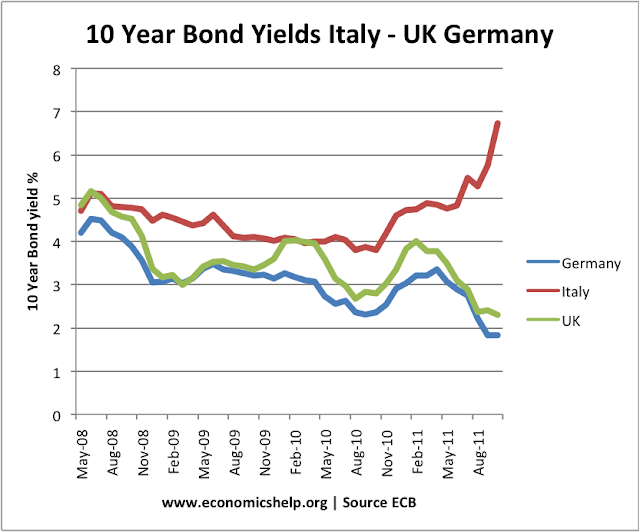 See: Problems of Italy - why Italian bonds increased despite having a much lower budget deficit than UK. The great recession of 2008-11 showed the vulnerability of Euro member countries to a common monetary policy. Because they can't devalue and also ask the Central Bank to buy government securities they are at much greater risk of a liquidity crisis. Because of fears over liquidity crisis, bond yields rose from Ireland, Spain, Portugal and Greece. As a result these eurozone countries were forced into pursuing spending cuts, and accepting higher interest rates. But, this led to a vicious cycle of lower growth and lower tax revenues. UK economy has additional problems which make joining the Euro a bad idea. Housing market. Many in the UK have a mortgage which is a big % of their disposable income. This is related to the high cost of buying houses in the UK. Variable Mortgages In the UK more homeowners have variable mortgages. These two factors means UK consumers are very sensitive to changes in the base rate. If the ECB kept interest rates higher than the UK needed it would create serious problems in the UK. Arguably to join the UK would need to reform its housing market and reliance on variable mortgages. Just like in the U.S., the financial crisis definitely affects lots of businesses as well as individuals. It is good to find other ways to earn money to sustain our needs. Economics Help. Simple theme. Powered by Blogger.